Can the sky alone be enough for a picture? For astrophotography or meteorological studies, the answer is obviously yes, but what I mean to question is whether we need a bit of landscape to make a sky image interesting enough to hold our attention. 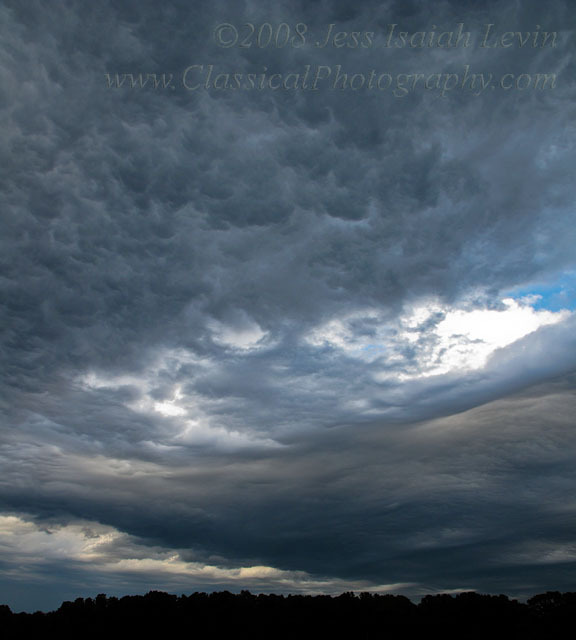 The North Carolina Piedmont experienced a strong cold front recently (Oct. 27, 2008), resulting in some unusual and fascinating cloud patterns. Some of the effects persisted for almost a half hour, while some of the most striking views were only to be seen for a minute or less. I was able to grab a camera and quickly get to a part of Raleigh that at least gave generally unobstructed views of the sky. The shot above should give you an idea of the sharp boundaries in temperature layers and moisture content that flowed over us. There were some brisk winds, but nothing cyclonic, very little precipitation, and a feast for the eyes! To address the question I raised at the top, I think the bit of tree line silhouetted at the bottom of this image is useful, partly because the diagonal line of dark cloud lowers to meet it. However, the sky really is my subject, so I was quite happy without a foreground subject in this case.